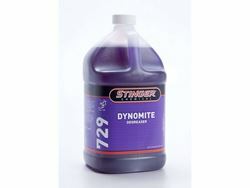 Stinger's Dyn-O-Mite Degreaser is Stinger's strongest degreaser. A heavy duty, high caustic cleaner that can be diluted 1:50 and can be used to strip paint, concrete and floors in its concentrated form. Available in gallons, 5 & 55 gallon containers.